Roadside botanizing with Linda Ellis will continue for the third year. We have had such a great time in the past two years, plus we want to keep an eye on the lookout for pincushion flower (Scabiosa atropurpurea) that is spreading into Arkansas from Missouri . So far, we have located several populations in Carroll County . Last year, we found a gravel bar that was fantastically arrayed in late summer vegetation, many of which we just don’t often see for staying indoors in air-conditioning in August. There are things to be found, so join us for this important field trip. We will meet at the McDonald’s parking lot just off Hwy. 62, on the west side of Berryville, in front of the Wal-Mart. 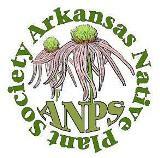 Note: This trip is organized by the Ozark Chapter of the ANPS. Consider joining the Chapter if you go. Dues are only $5.00 per year.